When asking our three bright 2014 interns, Maddy, Ryan and Zoe (pictured here), to reflect on their experience, three themes aligned with RRIP’s goals emerged. All three interns left the program with an enhanced understanding of the value of older adults, the elder abuse epidemic and the multitude of disciplines and opportunities existing within the elder justice field. Interns bring to RRIP their background and interest in working with older adults along with a positive view of aging and leave with perceptions that have evolved and deepened. 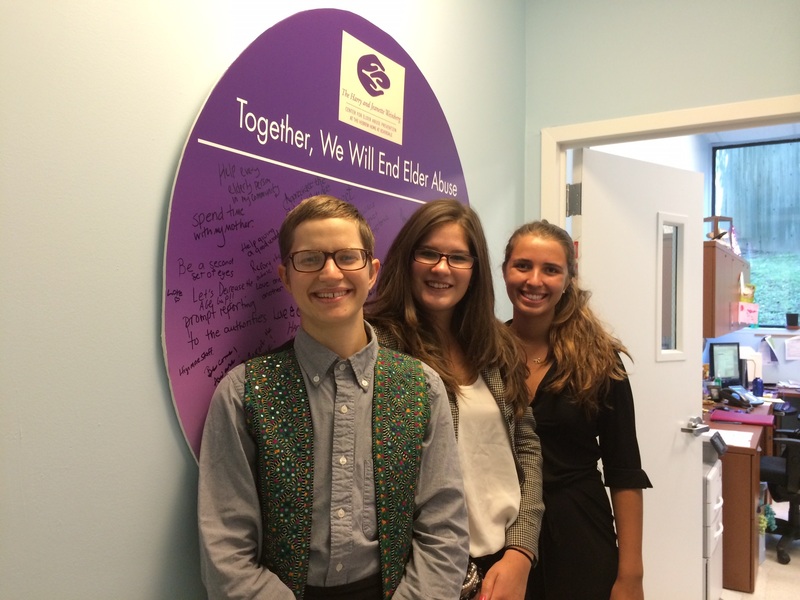 Maddy, Ryan and Zoe interacted directly with older adults through site visits to local NYCEAC partner agencies as well as by using The Legacy Project’s structured interview protocol to facilitate conversations with older adults about their lives. RRIP interns have often taken classes on aging or have worked in the field but haven’t ever been exposed to elder abuse issues. If elder abuse is covered in a classroom, the coverage tends to be brief and leaves students shocked. Maddy explained that “before taking an adulthood and aging class, I was ignorant to the severity of the elder abuse epidemic and, when my teacher taught an elder abuse section, I was appalled by what I heard.” This reality results in a lack of knowledge among aging professionals, which hinders our ability to prevent, detect and respond to elder abuse cases. Ryan states that “the existence and prevalence of elder abuse should be known by everyone, especially those working for and with the aging population.” It is clear that we need to expand the knowledge base within the aging workforce and provide opportunities for students to increase their understanding of elder abuse beyond the limited exposure provided in a classroom. By attending NYCEAC’s Multidisciplinary Team (MDT) meetings and by being exposed to elder justice leaders, RRIP interns gained an increased understanding of the prevalence and complexity of elder abuse as well as the need for increased public and professional education necessary to improve prevention efforts. In order to grow the elder justice field and continue pushing the movement forward, we need to inspire and recruit new professionals and students from across sectors and fields. This is a goal shared by RRIP and the elder justice field. 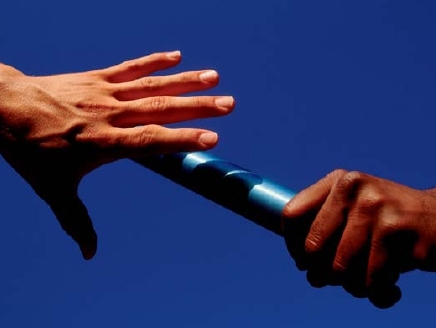 NYCEAC Executive Director, Risa Breckman, explains that, “the elder justice movement must encourage people to join the ranks in significant numbers – and we need folks of all ages in our relay race so the baton can be passed on and the work can continue.” This summer our students were inspired to join the relay. NYCEAC is grateful for the dedicated students who participated in RRIP for a summer as well as continued the work by raising awareness of elder abuse when returning back to school. Our 2013 interns brought our 14 Days of Thanks campaign to their campus and fostered increased recognition of the importance of older adults. Thank you to our three 2014 interns for their work, dedication and passion for elder justice and thank you our partner agencies that helped shape their experience! Do you know of an Elder Justice Internship or other elder justice focused programs for students? If yes, please share in the comments section below! 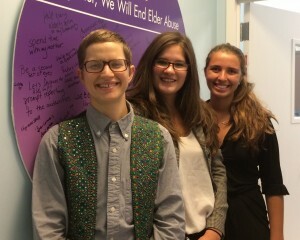 Hi- These interns are very articulate and grasped the many aspects of preventing elder abuse. They should speak in high schools about their experiences and what they learned about the “vibrancy” of our older population. 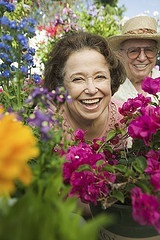 Changing attitudes towards aging is an important step as you know. All three interns have the capacity to effect change and influence all generations. What a great group of interns!